I've probably been to Atlanta a couple dozen times in my life. No lie. Between visiting family in the 'burbs as a kid to traveling for business as a "grown-up", Atlanta has been a constant in my life. I can't say that I've ever looked at Atlanta as a destination for anything other than flights for Augusta or to see family. Over my last couple visits to Augusta, I got the chance to see the city a bit differently. My re-discovery of Atlanta started a few weeks back with the fabulous Wrona family at a Braves game. When Jeff said he got "pretty good" tickets - I certainly wasn't expecting to be sitting 8 rows behind home plate. Seriously. Here I am standing next to our seats. This section of seating even includes waitstaff that will go get your $8 beer for you! Not a bad introduction to the city. A few weeks later, I'm back in Augusta and ready for a little bit more Atlanta. David, my buddy here in Augusta suggested we roadtrip to the ATL and visit the World of Coke and The CNN Experience. Sounded great! Then he called his aunt in Atlanta and arranged a place to crash Saturday night - even better! 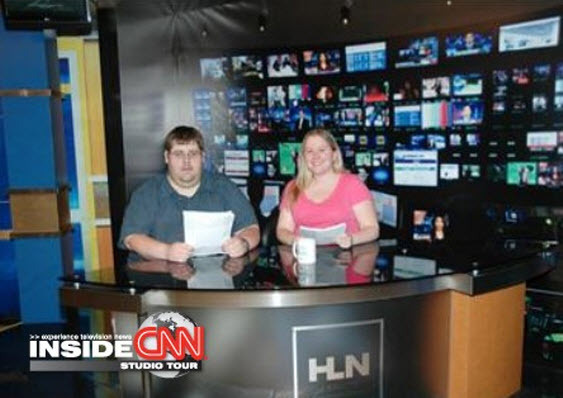 So late Saturday morning, we left Augusta for the ATL; first stop - the CNN Experience! Okay - our first stop was figuring out parking, but then we were off to visit CNN. What? Dorky photo op? Sign me up! Turns out it doesn't stand for "Clinton News Network"
We got our tickets and waited for the next tour. CNN is located in the (convienently named) CNN Center in Downtown Atlanta near Centennial Olympic Park. The building was originally named the Omni Center and is still home to the Omni Hotel. The original occupant of the space was The World of Sid and Marty Krofft, the worlds first indoor amusement park. The tour begins with a ride on the worlds longest free standing escalator to the 8th floor and tours the news rooms and studios of CNN and HLN. In a mock studio, we got a chance to have our photos taken sitting behind the anchor's desk. Breaking news - tourist hijacks news desk. More at 10. Oh! And who did I run into in the lobby? That's right, I got to meet a cardboard cut out of Anderson Cooper! After our tour, we headed outside the perimeter (I-285) to David's Aunt Mary's lovely new home. David, Mary, her husband Mark and I went to a bar and grill for dinner and to hear a reggae band play - so much fun! We wrapped up the awesome day driving back to their house with the four of us singing along with the radio - Buffalo Springfield's For What It's Worth, Janis Joplin's Me And Bobby McGee, and The Beatles' Hello, Goodbye. So much fun! His family was so nice to let us stay in their home (two extra guest rooms is a GREAT thing) and so much fun to hang out with!